Craniopharyngiomas are low-grade (World Health Organization [WHO] grade I) circumscribed epithelial tumors that most commonly arise in the suprasellar region. Craniopharyngioma comprises two clinically, histologically, and biologically distinct subtypes: adamantinomatous (most common) and papillary. [5, 6, 7, 8, 9] Rare hybrid forms have also been reported. Papillary craniopharyngioma occurs almost exclusively in adults, whereas adamantinomatous craniopharyngioma occurs in both adults and children. Adamantinomatous craniopharyngioma presumably arises from remnants of the Rathke pouch and the craniopharyngeal duct. Clinical features of craniopharyngiomas may include visual disturbances (from compression of the optic chiasm and adjacent nerves and tracts), endocrine abnormalities, and signs of increased intracranial pressure. Endocrine abnormalities may take the form of hormonal deficiencies or of diabetes insipidus. Cognitive and personality changes have also been observed. Magnetic resonance imaging (MRI) typically shows an adamantinomatous craniopharyngioma as a complex solid/cystic lesion with heterogeneous signal intensity. The cysts are often filled with fluid of a high protein content (thus, they are hyperintense on T1-weighted images). Solid areas reveal enhancement following gadolinium administration. Peripheral calcification is often prominent on computed tomography (CT) scans. MRI of a papillary craniopharyngioma characteristically depicts an enhancing, predominantly solid, circumscribed mass without the calcification or complex cystic architecture of the adamantinomatous variant. The papillary architecture may sometimes be evident. Although the imaging descriptions of the two morphologic variants are typically described as above, note that overlap and exceptions occur. In addition, there is overlap between the imaging characteristics of craniopharyngiomas of both subtypes and other sellar/suprasellar mass lesions of this anatomic neighborhood; thus, tissue examination is generally required for definitive diagnosis. Adamantinomatous craniopharyngioma is a partly cystic mass filled with dark greenish-brown fluid that has traditionally been compared in terms of color and consistency to "machinery oil." The characteristic white speckled appearance of "wet" keratin nodules typical of the adamantinomatous variant are frequently grossly visible and provide the neurosurgeon advance notice of the diagnosis before the pathologist even sees the surgical specimen. In contrast to the adamantinomatous variant, which tends to insinuate tongues around nerves and blood vessels, the papillary subtype is comparatively more well-circumscribed and typically lacks the complex multicystic architecture and fluid-filled spaces upon sectioning. The cytologic smear of papillary craniopharyngiomas reveals tissue fragments composed of benign squamoid cells, with only rare individual cells. Small cellular whorls are often seen. Adamantinomatous craniopharyngioma. Adjacent gliosis with Rosenthal fibers (medium power). BRAF V600E mutations have been demonstrated in up to 95% of papillary craniopharyngioma cases. This is a well-studied activating mutation of a serine-threonine kinase involved in cell division and differentiation via the MAP-kinase/ERK signaling pathway, which has been implicated in a variety of other neoplasms including melanoma, colorectal carcinoma, and papillary thyroid carcinoma. Although much more common in papillary craniopharyngiomas, the mutation may not be exclusive to this subtype. Bunin GR, Surawicz TS, Witman PA, Preston-Martin S, Davis F, Bruner JM. The descriptive epidemiology of craniopharyngioma. J Neurosurg. 1998 Oct. 89 (4):547-51. [Medline]. Kuratsu J, Ushio Y. Epidemiological study of primary intracranial tumors in childhood. A population-based survey in Kumamoto Prefecture, Japan. Pediatr Neurosurg. 1996 Nov. 25 (5):240-6; discussion 247. [Medline]. Izuora GI, Ikerionwu S, Saddeqi N, Iloeje SO. Childhood intracranial neoplasms Enugu, Nigeria. West Afr J Med. 1989 Jul-Sep. 8 (3):171-4. [Medline]. Zacharia BE, Bruce SS, Goldstein H, Malone HR, Neugut AI, Bruce JN. Incidence, treatment and survival of patients with craniopharyngioma in the surveillance, epidemiology and end results program. Neuro Oncol. 2012 Aug. 14 (8):1070-8. [Medline]. Giangaspero F, Burger PC, Osborne DR, Stein RB. 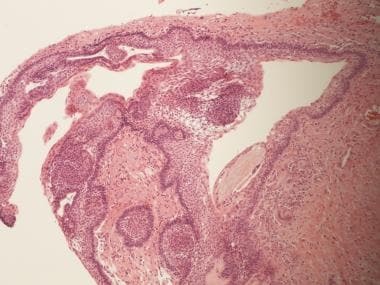 Suprasellar papillary squamous epithelioma ("papillary craniopharyngioma"). Am J Surg Pathol. 1984 Jan. 8 (1):57-64. [Medline]. Crotty TB, Scheithauer BW, Young WF Jr, et al. Papillary craniopharyngioma: a clinicopathological study of 48 cases. J Neurosurg. 1995 Aug. 83 (2):206-14. [Medline]. Malgulwar PB, Nambirajan A, Pathak P, et al. Study of β-catenin and BRAF alterations in adamantinomatous and papillary craniopharyngiomas: mutation analysis with immunohistochemical correlation in 54 cases. J Neurooncol. 2017 Jul. 133 (3):487-95. [Medline]. Yoshimoto K, Hatae R, Suzuki SO, et al. High-resolution melting and immunohistochemical analysis efficiently detects mutually exclusive genetic alterations of adamantinomatous and papillary craniopharyngiomas. Neuropathology. 2017 Aug 25. [Medline]. Larkin S, Karavitaki N. Recent advances in molecular pathology of craniopharyngioma. F1000Res. 2017. 6:1202. [Medline]. Miller DC. Pathology of craniopharyngiomas: clinical import of pathological findings. Pediatr Neurosurg. 1994. 21 suppl 1:11-7. [Medline]. Sekine S, Takata T, Shibata T, et al. Expression of enamel proteins and LEF1 in adamantinomatous craniopharyngioma: evidence for its odontogenic epithelial differentiation. Histopathology. 2004 Dec. 45 (6):573-9. [Medline]. Karavitaki N, Scheithauer BW, Watt J, et al. Collision lesions of the sella: co-existence of craniopharyngioma with gonadotroph adenoma and of Rathke's cleft cyst with corticotroph adenoma. Pituitary. 2008. 11 (3):317-23. [Medline]. Nishio S, Mizuno J, Barrow DL, Takei Y, Tindall GT. Pituitary tumors composed of adenohypophysial adenoma and Rathke's cleft cyst elements: a clinicopathological study. Neurosurgery. 1987 Sep. 21 (3):371-7. [Medline]. Prabhu VC, Brown HG. The pathogenesis of craniopharyngiomas. Childs Nerv Syst. 2005 Aug. 21 (8-9):622-7. [Medline]. Deutsch H, Kothbauer K, Persky M, Epstein FJ, Jallo GI. Infrasellar craniopharyngiomas: case report and review of the literature. Skull Base. 2001 May. 11 (2):121-8. [Medline]. Shah GB, Bhaduri AS, Misra BK. Ectopic craniopharyngioma of the fourth ventricle: case report. Surg Neurol. 2007 Jul. 68 (1):96-8. [Medline]. Sangiovanni G, Tancioni F, Tartara F, et al. Ectopic craniopharyngioma: presentation of a case arising from the corpus callosum. Acta Neurochir (Wien). 1997. 139 (4):379-80. [Medline]. Bashir EM, Lewis PD, Edwards MR. Posterior fast craniopharyngioma. Br J Neurosurg. 1996 Dec. 10 (6):613-5. [Medline]. Kawamata T, Kubo O, Kamikawa S, Hori T. Ectopic clival craniopharyngioma. Acta Neurochir (Wien). 2002 Nov. 144 (11):1221-4. [Medline]. Donson AM, Apps J, Griesinger AM, et al, for the Advancing Treatment for Pediatric Craniopharyngioma Consortium. Molecular analyses reveal inflammatory mediators in the solid component and cyst fluid of human adamantinomatous craniopharyngioma. J Neuropathol Exp Neurol. 2017 Sep 1. 76 (9):779-88. [Medline]. Agozzino L, Ferraraccio F, Accardo M, Esposito S, Agozzino M, Cuccurullo L. Morphological and ultrastructural findings of prognostic impact in craniopharyngiomas. 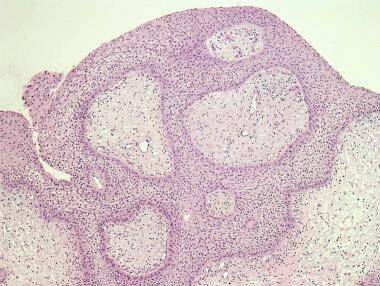 Ultrastruct Pathol. 2006 May-Jun. 30 (3):143-50. [Medline]. Hofmann BM, Kreutzer J, Saeger W, et al. Nuclear beta-catenin accumulation as reliable marker for the differentiation between cystic craniopharyngiomas and rathke cleft cysts: a clinico-pathologic approach. Am J Surg Pathol. 2006 Dec. 30 (12):1595-603. [Medline]. Stache C, Holsken A, Fahlbusch R, et al. Tight junction protein claudin-1 is differentially expressed in craniopharyngioma subtypes and indicates invasive tumor growth. Neuro Oncol. 2014 Jan. 16 (2):256-64. [Medline]. Sekine S, Shibata T, Kokubu A, et al. 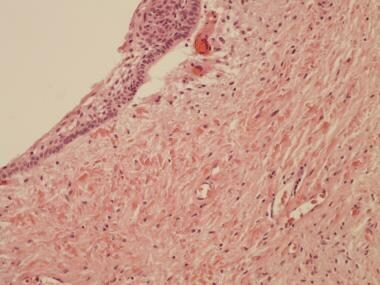 Craniopharyngiomas of adamantinomatous type harbor beta-catenin gene mutations. Am J Pathol. 2002 Dec. 161 (6):1997-2001. [Medline]. Hassanein AM, Glanz SM, Kessler HP, Eskin TA, Liu C. beta-Catenin is expressed aberrantly in tumors expressing shadow cells. Pilomatricoma, craniopharyngioma, and calcifying odontogenic cyst. Am J Clin Pathol. 2003 Nov. 120 (5):732-6. [Medline]. Schweizer L, Capper D, Holsken A, et al. BRAF V600E analysis for the differentiation of papillary craniopharyngiomas and Rathke's cleft cysts. Neuropathol Appl Neurobiol. 2015 Oct. 41 (6):733-42. [Medline]. Kusama K, Katayama Y, Oba K, et al. Expression of hard alpha-keratins in pilomatrixoma, craniopharyngioma, and calcifying odontogenic cyst. Am J Clin Pathol. 2005 Mar. 123 (3):376-81. [Medline]. Buslei R, Nolde M, Hofmann B, et al. Common mutations of beta-catenin in adamantinomatous craniopharyngiomas but not in other tumours originating from the sellar region. Acta Neuropathol. 2005 Jun. 109 (6):589-97. [Medline]. Brastianos PK, Taylor-Weiner A, Manley PE, et al. Exome sequencing identifies BRAF mutations in papillary craniopharyngiomas. Nat Genet. 2014 Feb. 46 (2):161-5. [Medline]. Holsken A, Kreutzer J, Hofmann BM, et al. Target gene activation of the Wnt signaling pathway in nuclear beta-catenin accumulating cells of adamantinomatous craniopharyngiomas. Brain Pathol. 2009 Jul. 19 (3):357-64. [Medline]. Larkin SJ, Preda V, Karavitaki N, Grossman A, Ansorge O. BRAF V600E mutations are characteristic for papillary craniopharyngioma and may coexist with CTNNB1-mutated adamantinomatous craniopharyngioma. Acta Neuropathol. 2014. 127 (6):927-9. [Medline]. Holsken A, Sill M, Merkle J, et al. 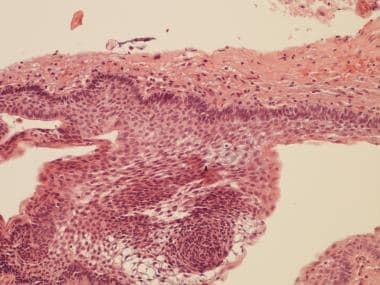 Adamantinomatous and papillary craniopharyngiomas are characterized by distinct epigenomic as well as mutational and transcriptomic profiles. Acta Neuropathol Commun. 2016 Feb 29. 4:20. [Medline]. Rickert CH, Paulus W. Lack of chromosomal imbalances in adamantinomatous and papillary craniopharyngiomas. J Neurol Neurosurg Psychiatry. 2003 Feb. 74 (2):260-1. [Medline]. Schmalisch K, Beschorner R, Psaras T, Honegger J. Postoperative intracranial seeding of craniopharyngiomas--report of three cases and review of the literature. Acta Neurochir (Wien). 2010 Feb. 152 (2):313-9; discussion 319. [Medline]. Frangou EM, Tynan JR, Robinson CA, Ogieglo LM, Vitali AM. Metastatic craniopharyngioma: case report and literature review. Childs Nerv Syst. 2009 Sep. 25 (9):1143-7. [Medline]. Combs SE, Thilmann C, Huber PE, Hoess A, Debus J, Schulz-Ertner D. Achievement of long-term local control in patients with craniopharyngiomas using high precision stereotactic radiotherapy. Cancer. 2007 Jun 1. 109 (11):2308-14. [Medline]. Yaşargil MG, Curcic M, Kis M, Siegenthaler G, Teddy PJ, Roth P. Total removal of craniopharyngiomas. Approaches and long-term results in 144 patients. J Neurosurg. 1990 Jul. 73 (1):3-11. [Medline]. Rodriguez FJ, Scheithauer BW, Tsunoda S, Kovacs K, Vidal S, Piepgras DG. The spectrum of malignancy in craniopharyngioma. Am J Surg Pathol. 2007 Jul. 31 (7):1020-8. [Medline]. Aquilina K, Merchant TE, Rodriguez-Galindo C, Ellison DW, Sanford RA, Boop FA. Malignant transformation of irradiated craniopharyngioma in children: report of 2 cases. J Neurosurg Pediatr. 2010 Feb. 5 (2):155-61. [Medline].